The Rockets trimmed $2.634 million off their payroll with the trade. Francis is returning to the Grizzlies franchise that originally made him the No. 2 overall pick in the 1999 draft when the team was located in Vancouver. When he said he would not play in Canada, the Rockets obtained him in a three-way deal that also involved the Orlando Magic. I think among outsiders or casual fans, Blake is probably the least valued, and most overlooked, starter on the Blazers. I know as a reporter, I often unconsciously overlook Blake in stories because he is ... well, boring. I find myself usually writing about a lob pass from Sergio Rodriguez to Rudy Fernandez, or a big block from Joel Przybilla, or of course, the late-game heroics of [Brandon] Roy. But there Blake is every night, putting up his solid numbers while never doing anything crazy or out of character -- just doing his job like a professional. This season, he is averaging a career-high 11.4 points while also adding 4.2 assists. He is shooting a career-best 43.3 percent on three-pointers. Nik Caner-Medley (2002-06) has signed with a new team (translation) in Spain: Cajasol Sevilla of the ACB (Spain's top pro league). The translation is bad, but as The Hoop blog helps to explain, Nik's Italian league team, Capo di Orlando, was relegated to Italy's second division (Lega2) as punishment for falsifying documentation. When the team was sent to the lower division in October, Nik became a free agent. Caner-Medley joined the team (translation) on Thursday and is ready to try to help Cajasol turn things around. Nik previously played in the ACB last year, for Kalise Gran Canaria. Can't get enough of watching Lonny Baxter (1998-2002) hit the 2 foot jumper or shoot free throws? Then this is the video for you! Watch the highlights from Baxter's huge night as his team, Panionios ON Telecoms (Greece), beat Efes Pilsen (Turkey) in a Euroleague game from last month. Posting video clips from YouTube is a time-honored tradition on this blog for killing the November/December player transaction news void. Here is a highlight reel of Drew Nicholas (1999-2003), playing for Panathinaikos (#11 in white) and leading his team over rival Olympaicos in a game a few days ago (the game story has a big picture of teammate Sarunas Jasikevicius). Unrelated, but still worth reading as you digest turkey and slip into a post-meal food coma today, the Terrapin Nation blog has a great rant about the UMTerps.com website, which I'm linking to not just because they linked to me, but mainly because it gets to the heart of why my own blog came into existence and has become a thriving hobby (which I'm thankful for today). "We are excited to have Tahj join our staff," said head coach Dave Calloway. "He was a terrific player, who came out of the Shore, and went on to win a national championship. I think he is someone our younger players will be able to look up to for guidance and support." "I am happy to be back home, with this great opportunity to be part of a solid program," added Holden. "I look forward to helping this program continue its winning tradition, in any way I can." Prior to joining Monmouth, Holden was the Assistant Varsity Coach, as well as eighth grade basketball coach at La Jolla Country Day School in San Diego, California. While at La Jolla, Holden also served as the junior varsity coach in 2006-07. This came up in a recent Washington Times blog entry on the Gary Williams coaching tree. After being cut by the Houston Rockets on the eve of the NBA regular season, DJ Strawberry (2003-07) has signed (translation) with Fortitudo Bologna of Italy's Serie A league (the top pro league in Italy). While DJ apparently cannot play with the team until November 24 (30 days after his release from the Rockets), he is in Bologna, Italy getting ready to play. What do you expect from this new experience? Maybe affirmed beyond the U.S., where the most famous name is that of your father for what he did on the baseball diamond? DJ: "When the college Drew Nicholas told me with enthusiasm his experience, Since then I have always regarded Europe and especially Italy forward a hypothesis, then here playing my former comrades such as Gist and Collins that I can not wait to meet again." Smith wasn't so comfortable Friday, admitting he was hesitant in traffic. But he took two shots to the face against the Lakers that gave him confidence he could survive blows when mixing it up in the lane. "I just got to get used to being in the paint and being around a lot of bodies again," Smith said. Perhaps Smith's biggest hurdle will be learning to play with a new set of teammates after only 44 minutes of preseason action and very few practice hours while protecting his injury. Smith's teammate, Chris Wilcox (2000-02), did indeed heal up after the above story was written and led the Thunder with 15 points in their first regular season game. There is a good Steve Blake (1999-2003) interview on the Hoops TV Online website today. Steve talks a lot about his outlook for the upcoming Blazers season, his career so far, and how he keeps in touch with his Maryland teammates and Coach Williams. It hearkens back to the series of stories from back in August about how Steve has become one of the leaders in Portland and is loved on and off the court by the city. Dixon, originally drafted by the Wizards out of Maryland in 2002, missed the first four preseason games with a calf injury but returned to action Friday against the New Orleans Hornets. After three strong practices, Dixon feels confident he can help the Wizards, who open the season at home Oct. 29 against New Jersey. "Just knowing the system, Coach has a lot of confidence in me," Dixon said. "He knows that I'm going to go out and execute the play, be in the right positions on the floor. And my job is to do whatever they ask of me, so whatever my role is, that's what I'm going to go out and do." Strawberry, acquired from Phoenix for Sean Singletary, also played well, averaging 8.2 points on 41.7 percent shooting. With Friday's move, the Rockets trimmed their roster to 14 players, one fewer than the league maximum, but there are no immediate plans to make an addition to the roster that already takes the Rockets' payroll past the luxury tax threshold. The Dalaman A.Ş. Pamukkale University basketball team announced its first foreign transfer player is Travis Garrison from the United States. Having previously played in South Korea, Spain, and Venezuela, Garrison is 24 years old, 2.05 meters tall. Travis Garrison has signed a one-year contract with Pamukkale. Ekene Ibekwe (2003-07) has signed on with Mutlu Aku Selcuk University of Selcuk, Turkey. The team released a press release announcing his signing earlier this week. Want confirmation? Here's a news article which repeats the team's press release almost word for word. With its preparations for the new season, and Turkish Cup final stage for şehrimizden Erzurum tomorrow we will move to the team, 4. Ekene Ibekwe agree with foreign as an actor. The season which We finished Israil a cave Galil with at a Gilboa team at the 10 matches 11.3 A number, 5.3 She centers ribaund and which play with Federal Republic of Nigeria Pivot percent at the 2 numbers 65 77 percent at the free shot percent an owner. 2.06 1985 pivot born at your distance last NBA the league had worn the form Summer. Cengiz which the head trainer clarifies that the transfer increased her power under the crucible team Montenegro Ekene Ibekwe is immediately to my jewelry piece I think that she will provide harmony. To the extra league cupful full staff and a ready halo We came. Ibekwe cupful last eight and the one at the league Play-Off your contributions will become important for our target I believe. She told. Happy Battery Selcuk University, Turkish Cup for the matches tomorrow we will Konya?dan Erzurum?a the move. Apparently, translating Turkish to English is very hard. As far as I can tell, Selcuk's team is sponsored by the Happy Battery company. While researching this story, I also learned that Selcuk is famous for its Camel Wrestling Festival in January. You won't read about that on your other Maryland sports blogs. On the afternoon of Thursday, Trouville heralded the arrival of Travis Garrison. He stands 2.03m tall, weighs 109kg, and is 24 years old. In the 2006/07 season, he played for the Great Falls Explorers (CBA), where he averaged 11.9 pts., 6.1 rebounds, and was chosen Rookie of the Year. In 2008 he played for Gaiteros of Zulia, Venezuela. Last week, I was on vacation for the biggest ex-Terp news of the off-season: Juan Dixon (1998-2002), signed a one-year deal with the Washington Wizards. Hopefully one of the many local newspapers or other Terp blogs from my sidebar over there on the right filled you in on the news in my absence. Dixon won't wear the No. 3 he sported during his earlier, three-year stint with the Wizards -- that number is now the property of two-time all-star forward Caron Butler -- but even in choosing new digits, Dixon will be going back to his roots. According to his agent, former Wizard Mitchell Butler, Dixon received interest from several teams over the summer, including New Jersey, Denver and New Orleans, plus a few European teams, but a big offer never materialized. As the free agent market dried up and roster spots diminished, the Wizards and Dixon agreed to a deal that made sense for both sides. Though Dixon has to make the team and would earn the veteran minimum of $1.03 million for the season, a solid year could set him up to earn a bigger contract next summer. This isn't really former Terp news, but one of the key reference sites I use for this blog, TerrapinStats.com has recently been redesigned and retooled. Readers (like you!) can now leave comments on games or players and submit links to stories about players and games. They have detailed basketball stats for all Maryland games and players going back to the 1989-90 season. I particularly rely on the site to aid my memory on things like what years Rodney Elliott played (1994-98) and how to spell Sarunas Jasikevicius. Many of the player pages have a handy link to this blog for current news about what former Terp players are doing now, so really, how can you not like the site? For football fans, TerrapinStats.com also has football game results going back, amazingly, to the 1892 season (we went 0-3 that year, including a loss to a local high school team). Laura Harper (2004-08) and Shay Doron (2003-07)have both signed to play for Besiktas Cola Turka of Turkey for next season. Here are player pages for Harper and Doron. Beşiktaş Cola Turka Women’s Basketball Team has added Israeli guard Shay Doron, American center Laura Harper and forward Alexis Hornbuckle to its roster. She played an important role in the Maryland University’s NCAA title in 2006 and Elitzur Ramla’s first place league finish in 2008. Doron, who also plays for the Israeli national team, took part in the Euro Cup semifinals last year. After winning the prestigious NCAA Championship in 2006, she was part of the team when the USA Under-23 Team grabbed the world title in 2007. She was selected as the most valuable player in NCAA Final-Four Tournament. She is currently with the Sacramento Monarchs of the WNBA and will join Beşiktaş Cola Turka once the WNBA season ends. In addition to its league scheudle, Besiktas is scheduled to participate in the FIBA Women's Euro Cup tournament this winter. Two years ago, Rodney Elliott played for Besiktas's men's team. Bambale Osby (2006-08) has signed in Romania (translation) with U Mobitelco Cluj-Napoca. The linked story in the Ziua de Cluj newspaper doesn't say much about Osby; it's more of a summary of the whole team's preparation for the upcoming season. They note that Osby will be joining the team in Cluj next week, and the team is looking to him to help improve their defense while increasing the team's average height from last year, as part of a total team transformation that sees only five players returning from last year's squad. American Bambale "Boom" Osby is the final new player to join "U" Mobitelco to play the 4-5 positions. Osby (22 years old, 2.03 meters, 120 kg) is expected next week to join the team. "He's a player who will help us not only in our offensive game, but also on defence, and further, will make a spectacular addition to our team," said executive chairman Mircea Cristescu, on the final acquisition of the team. "Boom" comes from the University of Maryland and will be the seventh in the batch of foreign "U" Mobitelco players after the arrivals of Leon, Majstrovich, Glintic, Gibson, Kinsella, and the extended contract for Cuic. This will be Osby's first European experience, along with Leon and Gibson. "Boom" concluded the 2007-2008 season with an average of 11.5 points, 0.8 assists, 6.5 rebounds (2.1 offensive) per game. The second half of the press release is his career highlights, conveniently cut-and-pasted in English from some other source. Boom joins Mike Jones, who is also playing in Romania next season. He is expected to be with the Rockets in training camp and in the preseason. His contract is non-guaranteed unless he makes the opening night roster. "He's got a shot to make it," Rockets general manager Daryl Morey said. "He's different. He's athletic, can really defend multiple guard spots. Phoenix was starting to use him at the one. That's where he'll be unique. He might have a chance to catch on in the league even he was just at the two just from his defensive ability. "If we feel like he can (handle the point offensively) then we feel like we got something there." Strawberry (6-5, 201, Maryland) averaged 2.2 points, 0.9 assists and 8.2 minutes in 33 games as a rookie with the Suns in 2007-08. His 33 appearances were the most games played by a Suns rookie since Zarko Cabarkapa (49) in 2003-04. Strawberry scored a season-high nine points vs. New Orleans (2/6/08), as well as notching season bests of seven rebounds and seven assists vs. Portland (4/16/08). He also made his career playoff debut in Game Four vs. San Antonio (4/27/08). Selected by the Suns in the second round (59th overall) of the 2007 NBA Draft, Strawberry posted career bests in points (14.9), rebounds (4.4) and steals (2.03) in 34 games of his senior season at Maryland. Strawberry, the son of former Major League Baseball star Darryl Strawberry, earned All-ACC Second Team and ACC Defensive Team honors in 2006-07, while becoming just the 45th Terp in school history to reach 1,000 career points. After an NCAA career at the University of Maryland (senior year: 15 points and 7.4 rebounds per game), Rodney played for some minor league teams in American before landing for good in Europe in 2001, where he played in Italy, Spain and Turkey. A very good three-point shooter and able to play under the basket, this 2.02m forward is a reliable and versatile player. His complementary play with Michel Jean-Baptiste Adolphe could quickly bear fruit. The American player completes the 2008-2009 roster. 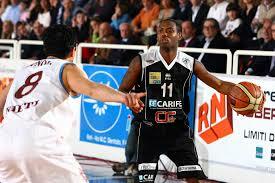 The FASTWEB JUNIOR CASALE team announces that it has signed an agreement with American JAMAR SMITH. Born December 5, 1980 in Sicklerville (New Jersey), Jamar attended Overbrook High School. After high school and two seasons at a Junior College in Cumberland, MD, he chose to play for the University of Maryland in the NCAA. He played in the 2004-2005 Premier League in Israel with Maccabi Haifa, then in two successive seasons he has played in the NBDL with the Austin Toros. Last year, he played with Toshiba Brave Thunder in the Japanese league. The first words of Jamar Smith: "This year I played in a league as competitive and demanding as Italy. I am truly anxious to get to know my teammates and start working. From what I have mentioned, the Juniors can help me find the conditions to grow as a man and as a player. My goal? To compete and improve our chances of winning the championship." Joe Smith (1993-95) will play for his ninth NBA team next season, after being traded from Cleveland to Oklahoma City (where he will join Chris Wilcox, who moved there with the rest of the franchise from Seattle). The team is waiting to officially introduce the new players until they have announced the new team name, colors, and jerseys, so that the players can hold up a jersey with their name on it. The Rimini Crabs basketball club communicates with extreme satisfaction that it has signed a one-year agreement with U.S. athlete Chris McCray. McCray, born in Capitol Heghts, MD on May 7, 1984, is a guard-wing, 1.96 m, 87 kg, and the product of the prestigious University of Maryland. By his senior year with the Terrapins, he was registering constantly growing statistics and reached the semifinals of the prestigious NIT in 2005. After college, he signed with the Milwaukee Bucks as a free agent, playing in 5 NBA games before moving to the Dakota Wizards, with whom he won the NBDL league title. In last season's debut in Europe, McCray signed with Telindus BC Oostende (Belgium-D1), playing in the league tournament and the ULEB Cup. Quick and very athletic, he is a natural shooter, and over the years has added strength and aggressiveness to his game. Commented GM Renzo Vecchiato: "Of all the foreign players available, we were extremely easily convinced he was our best choice. He is a player with technical sophistication, both on attack and in defence. He is still young, with ample room for improvement." Angelico Biella Basketball announces that it has signed an agreement with James Gist. According to team official Luke Bechi: "We are very pleased to be able to have Gist in our next team. This is James' first overseas experience, but he comes from a prestigious college at Maryland. The player is an incredible athlete and defensive stopper of the first degree, and the former Terrapin also has a good mid-range shot. Moreover, he has the great ability to play above the rim and a natural propensity to rush to counterattack and rebound. The player, along with other companions in the frontcourt, will give our team a big presence under the boards." Standing 2.06m, James Gist was born in Silver Spring, Maryland, October 26, 1986. After attending Good Counsel High School in his hometown, he was recruited by the University of Maryland and trained with Gary Williams, one of college basketball gurus. For the Terrapins, he earned playing time as a freshman, increasing his minutes season by season to join the starting five of the Terps as a Junior. His Senior year was the year he reached the peak of his collegiate career with almost 16 points and 8 rebounds, with more than 2 blocked shots per game, and was voted to the All-ACC Defensive First Team (against players from ACC schools like North Carolina and Duke among others). After the experience in college, Gist attended a workout with the Portland Trail Blazers and Sacramento Kings, but was chosen by the San Antonio Spurs with the 27th pick in the second round. After the Summer League in Las Vegas, where he played well with the Spurs, getting 11 points and 8 rebounds per game in 22 minutes spent on the court, James Gist now takes the path to Europe, choosing Biella as the starting point of his professional career. Spurs fans are upset about losing Gist to Europe, but it was unlikely that the Spurs could make room on their already stacked roster for their draft pick. Gist most likely would have ended up playing for the Spurs NBA D-League affiliate, the Austin Toros. Despite signing for one year in Italy, the Spurs will still retain Gist's NBA rights for two years. Gist will join former Terps Nik Caner-Medley (Upea Capo d'Orlando) and Andre Collins (Carife Ferrara) playing in the Italian Lega A next season. American Mike Jones (1.96m, 90 kg, 24 years) played for the University of Maryland and is recognized as one of the great American outside shooters... I mean well outside the three point line, because this basketballer with the same name as a rapper is a specialist of shots from over seven and a half meters. Some called him the best defender among high school players, after NBA super star Lebron James. Many were surprised that he was not drafted in 2007; he left to play for Mersin in Turkey and APOEL in Cyprus. -- Jones was a high school All Star before entering the University of Maryland, where he once managed a record of 9 three-point baskets in a single game! -- In November of 2005 he became a father with Morgan Howard, bringing a little one into the world: Camryn Howard-Jones. -- At the first workout, Mike has impressed with his physical qualities, accuracy and precision from great distance. In scrimages played, Jones and Ionel Dodoc were the best shooters and have competed with Alex Iacobescu shooting three-point baskets. The American player is at CSU for several days, and then the club managers will make a decision on him. Sarunas Jasikevicius (1994-98) is not only the only former Terp playing basketball in the Olympics this summer, but he was selected to be Lithuania's flag bearer for the opening ceremonies tonight. Watch for him on TV tonight! Several former Terps are also competing in Beijing in field hockey and soccer. Former Terp field hockey players Lauren Powley and Sara Silvetti are blogging their Olympic experience. In 2007, after summer league and training camp with the Sacramento Kings and a brief appearance in D-League, Caner-Medley signed with the Spanish Kalise of Gran Canaria. He scored 7.8 points and 4.3 rebounds per game while averaging 19 minutes in league play. In ULEB Cup games, his stats rose to 13.6 points and 4.9 rebounds (with 68% from the field). According to the team: "Nik Caner Medley was the first choice of our coach for both wing spots (small and large wing) since last season. We have made a sacrifice to get him, since he is a high-level player in Europe, pursued by several clubs and returning from an excellent summer league with the Los Angeles Lakers. We think it can be very suitable for the way we play; he gives us a great dimension one-on-one and in the open court that our coach wants from his players." The Maryland Terrapin Basketball Commentary blog appears to have had a short lifespan (2/19/08 - 4/2/08), but before the postings stopped at the end of last season, they ran a listing of all 18 Maryland players who have played in the NBA since 1990 along with their statistical averages and career earnings. It will probably come as no surprise that Steve Francis ranks first with around $65M in career earnings, Joe Smith is second with $52M, and Walt Williams is third with $35M. Back in May, former Terp Shay Doron (2003-07), who was a leader on the Terrapin women's basketball championship team in 2007, won another championship: this time, her pro team, Elizur Ramla, won the Israeli championship. I found this thanks to DC BasketCases, which also notes that Doron was cut by the WNBA's New York Liberty, so she will not be playing back in the U.S. this summer. After her team won the Isreali Championship, Israeli Cup, and advancing to the semi-finals of the Women's Eurocup, Shay was named Player of the Year by the league's coaches. There's not much Terp action in the NBA Summer League this year. James Gist (2004-08) will try to make the team in San Antonio. Meanwhile, DJ Strawberry (2003-07) and Ekene Ibekwe (2003-07) are playing together again for the Phoenix Suns. The newest addition to the Baltimore Catholic League coaching fraternity is one of the most underrated but finest players in Maryland basketball history. He's also the president of a company, a father of two, fluent in French and a former roommate of Len Bias. He has played professionally for 16 years and visited 38 different countries. "Sometimes I wonder where the time has gone," Derrick Lewis said. "I have been very lucky." umterps.com: Do you still try to get out and play a little bit? JM: I still have the bug, no question. I still go out a few days a week and get in some pickup games. For a while I was considering going overseas to play because I still have that bug. I still felt like I have a lot of games left in me and can continue to get better as a basketball player and make some money doing it. But Under Armour is probably a better situation for me in the long run. I learned a lot from basketball, but you can't play forever. BUENOS AIRES -- The pivot-wing American, Travis Garrison (24 years old and 2.3 metres) is the first foreign reinforcement of Quilmes in Mar del Plata to face the upcoming national basketball league. Garrison has a good track record in the league of Korea, Spain (LEB gold) and Venezuela. The 'beer' has as tokens national Hernando Salles, Paul Gil, Maximilino Maciel, Ezequiel Dentis, Esteban Lopez and Nicholas Romano (Sub 23). Today, here is recap of how all the Terps playing in Europe (and elsewhere in the world) fared this season. Finding stats for all these players is very time consuming, so I didn't do it this year. (Particularly since many European teams play in multiple leagues: their national league, Euroleague, the ULEB Cup, various other tournaments, etc.) Really, I meant to write this weeks ago right after the NBA Wrap-up. Sarunas Jasikevicius's team, Panathinaikos of Athens Greece, won the Greek League Championship for the 6th consecutive year. Panathinaikos also advanced to the round of 16 of the Euroleague Club Championships. Lonny Baxter's team, Panionios, also from Athens, Greece, finished in 3rd place in the Greek League, losing to the aforementioned Panathinaikos in the Greek League semifinals. Terence Morris's team, Maccabi Tel Aviv, of Isreal, made it to the Euroleague finals before losing to CSKA Moscow, who then signed Terence after the season ended. Maccabi Tel Aviv also made it to the Israeli league finals, losing by one point, despite 20 points from Morris. Maccabi also lost in the finals of the Israeli Cup back in February. Also in Israel, John Gilchrist's Nahariya Ironi finished in 4th place after losing in the other semifinal of the Israeli league. Laron Profit's Libertad Sunchales, of Argentina, won the Argentinian league championship. Chris McCray's Telindus Oostende, of Belgium, lost in the quarterfinals of the Belgian League Tournament, but did manage to win the Belgium Cup tournament back in April. Mike Jones's APOEL, of Nicosia, Cyprus, finished in 2nd place, losing in the finals of the Cypriot League. On its way to the finals, Jones and APOEL beat Ryan Randle's AEL Limmassol in the semifinals. In Italian Lega2 play (Italy's 2nd division), Andre Collins was the league MVP and Carife Ferrara won the regular season championship (but lost in the finals of the league tournament), meaning Carife will move up to play in the Italian A division next year. Meanwhile, Rodney Elliott's Agricola Gloria team finished 15th in Lega2, and will drop down to the B1 division next season. Nik Caner-Medley's Kalise Gran Canaria, of the Canary Islands, Spain, finished 9th and just missed the playoffs in the Spanish ACB league. Ekene Ibekwe's Beascanon finished 8th in the French ProB League. Travis Garrison is currently playing for Gaiteros de Zulia of Venezuela, whose league has just started the postseason. Gaiteros finished 4th in the regular season. He also played in Spain and South Korea earlier this season. Jamar Smith's Toshiba Brave Thunder team finished 7th in the Japanese Pro Superleague. Drew Nicholas helped Turkey's Efes Pilsen get to the Euroleague round of 16, but was released from the team in March for refusing to travel to Serbia. Only Steve Blake and Chris Wilcox had years with numbers better than their career averages. Wilcox and Steve Francis struggled with injury-plagued seasons. Juan Dixon and Joe Smith were traded mid-season. DJ Strawberry spent the middle part of the season playing for Phoenix's NBDL Affiliate, the Albuquerque Thunderbirds. The regular season is long over, but Juan Dixon and the Detroit Pistons are still alive in the NBA Playoffs (2 games, 3.5 mpg, 0.0 ppg, 0.0 rpg, 0.0 apg). Joe Smith (Cleveland, 13 games, 20.2 mpg, 6.6 ppg, 4.6 rpg, 0.5 apg) and DJ Strawberry (Phoenix, 1 game, 5 mpg, 0.0 ppg, 1.0 rpg, 0.0 apg) also played in the NBA Playoffs this year. Thanks to the long layoff between the quarterfinal and semifinal rounds of the Euroleague 2008 tournament, it completely slipped my mind to check back in on the Euroleague Championships after their Final Four two weeks ago. But in the finals, Morris and company came up short against CSKA Moscow, losing 91-77. Morris had almost the same box score line as in the semifinals: 13 points, 7 rebounds, 1 block. Some ex-four-letter-school player named Trajan Langdon led CSKA with 21 points. Maccabi Elite was lead by Georgia Tech's Will Bynum with 23 points. So I think it's fair to say that the ACC owns Euroleague. There is a series of interviews with Byron Mouton (2000-02) up on PlayersVoice.com. Byron talks about the NBA playoffs, Maryland basketball, and his own career. There are four audio segments there to listen to; each is around 10 minutes. If you're finding this page late and the interviews there aren't Byron, search the archives for the 5-8-2008 show. After spending the winter playing in Japan, Jamar Smith (2002-04) briefly returned to play a few play-off games for the NBA D-League's Austin Toros in April, after DerMarr Johnson was called up to play for the NBA's Spurs. Jamar played for the Toros the previous two seasons (2005-07). "The past few weeks have been the craziest of my life," Langhorne said. "Playing with the U.S. team and veterans like Lisa Leslie and Katie Smith was amazing, but I'm really so happy to be back, ready to get settled and become part of this team." There's no time to waste as Langhorne rapidly becomes a regular part of the Mystics' makeup, adapting to new teammates and coaches -- and the plays Coach Tree Rollins handed the rookie when she arrived. Luckily, Langhorne said, Washington's style is similar to the Terrapins' and includes many familiar plays, with different names. Did you know that DJ Strawberry (2003-07) is the son of former major league baseball star Darryl Stawberry? It's true! The Arizona Republic wrote a story about DJ and his famous father this month. But D.J. — who uses the name his family has always called him — stopped trying to run from the embarrassment long ago. He embraces the relationship and the tag that it always will bring him. "Everybody says I look like my dad," said the Phoenix Suns rookie guard, who played college basketball for Maryland. The Suns might have benefited from Darryl's sordid background. D.J. nearly went undrafted until Phoenix selected him at No. 59. During the pre-draft screening, teams constantly asked about drugs and off-court behavior, even though D.J. had never been in trouble. "That's not fair," Darryl said. "He shouldn't have been labeled for that, because he has nothing to do with my life. The same Arizona Republic writer also has a story about how DJ is hoping to improve his game, learning from his rookie year experience and getting better over the summer. "I've learned a lot about the game, how to be a professional and how long the season is," Strawberry said. "You hear about the rookie wall, but you don't know it until you feel it. It came to a point where I was tired every day. I didn't feel like going to the gym and working out, but it's my job. I pushed through it, and it made me better in the end." Former Terp walk-on Atman Smith (1996-98) is one of three co-founders of the Baltimore-based Holistic Life Foundation, Inc. HLF hosts mentoring and after-school programs which stress the interconnectedness of people and the environment in which they live. They also teach yoga and holistic health, and facilitate environmental advocacy work at dozens of after school programs, camps, and recreation centers. Atman is the foundation's Director of Youth Programming. You can read more about HLF Inc. and its history and mission on their website. Duane Simpkins (1992-96) is the Head Coach of the varsity basketball team at St. Alban's School in Washington, DC. They have a bio of Coach Simpkins (PDF) on their athletic department website. Simpkins had previously been the coach at Sidwell Friends School, also in DC. "The makeup of this team, is guys that other teams didn't want," Dixon said. "You go around this locker room. It's like that with everybody." And it is that familiarity that has made the former Toronto Raptor's transition to an already crowded backcourt surprisingly smooth. "That's why this is the perfect team for me," Dixon said. "Everybody in here knows what it feels like to not be wanted." Former University of Maryland guard Parrish Brown has signed with the Elgin Racers. Brown, a 6-1 guard, played two years at Maryland after two seasons at Kennedy King Junior College. Brown averaged 22 points, 5 rebounds, and 5 assists. At Maryland, Brown played both guard positions, and was one of the team leaders in free-throw percentage. During Brown's senior season, Maryland finished 25-9 advanced to the second round of the NCAA Tournament. Racers president/coach Michael Murphy said: "The organization is very excited that Parrish will be wearing a Racer jersey for us this spring. He has an outstanding background and has played against the best competition the college game has to offer. We expect him to be a force on both ends of the floor." The IBL consists of 18 teams, mostly in the U.S., but as the league's name implies, there are international teams in Canada, Holland, and China this season. Their regular season runs from early April to late June. Maccabi Elite of Tel Aviv Israel, with ex-Terp starting forward Terence Morris (1997-2001), rolled on to the Final Four of the Euroleague Championships last night, winning game 3 of their series with AXA FC Barcelona, and thus winning the quarterfinal series 2 games to 1. Maccabi won game 1 in Tel Aviv, with Morris getting 14 points and 10 rebounds. They then lost game 2 on the road in Barcelona, despite 16 points, 11 boards, and 3 blocks from Morris. Heading back home again this week, Terence scored 8 points and 8 rebounds in the series-clinching game 3. For the whole tournament, Terence leads all players with 1.87 blocks per game. He is in second place for the tournament in rebounds, (8.43 RPG), but was the rebounding leader for both the round of 16 (10.17 RPG) and the semi-final round (9.67 RPG). Up next: Maccabi takes on Montepaschi Siena in the semi-finals on May 2 (trivia: Lonny Baxter played for Siena last year when they won the Italian League Championship). The Final Four is one-and-done. No "best-of" series. The finals are on May 4. And now, let's learn some basketball fundamentals with Terence Morris. I hope we've all learned something to make ourselves better players today. In yesterday's annual WNBA draft, two Terps were selected in the first round. Crystal Langhorne (2004-08) was drafted with the 6th pick by the Washington Mystics, and then shortly thereafter, Laura Harper (2004-08) was drafted with the 10th pick by the Sacramento Monarchs. Langhorne, who was joined at the draft by her parents, two brothers and Maryland Coach Brenda Frese, is the Terrapins' all-time leading scorer and rebounder. The two-time all-American and ACC player of the year averaged 17.3 points and 9.4 rebounds and made 64.7 percent of her shots last season. She had hopes of being selected in the first round but wasn't sure what to expect on draft day. Langhorne's teammate, Laura Harper, was chosen by the Sacramento Monarchs at No. 10, giving Maryland two first-round picks for the first time in school history. "We're just elated," Frese said. "What a proud moment, special day for Maryland basketball." Harper was stunned to hear her name called when it was. "When I heard my name I was euphoric," Harper said. "I didn't know if it was a dream or what. Playing amongst a class of so many talented players, it's just like the bar is set so high. To be among them, I just felt speechless." For four years, Crystal Langhorne and Laura Harper were inseparable on the Maryland women's basketball team's front line, not to mention their time together on a Philadelphia-area Amateur Athletic Union team before that. The pair, integral pieces of the Terps' 2006 national championship effort, were sent to opposite coasts yesterday in the WNBA draft. Apparently Byron Mouton (2000-02) had re-signed in February for a brief stint with the Wilmington Sea Dogs, who now play in something called the "Premier Basketball League" instead of the ABA. Don't bother looking for him on the roster or stats page of the Sea Dogs' website... they haven't updated the team stats since January 11. I only noticed he was there because his team got eliminated from the playoffs by the Maryland Nighthawks recently. Byron played for the Sea Dogs last year, when they were an ABA team, then briefly played for the Albany Patroons (of the CBA) last October-November. So anyway, Mouton played for Wilmington for about a month (and played quite well from the news stories I found on Google), and now their season is over. Remember to come back to my blog for all your fresh, breaking news stories about things that happened a month ago that I just now noticed. Sylvain Lautié wanted to quickly find a player to replace Adam Waleskowski, who will be out with an injury for at least 8 weeks; he has done that with the arrival of Nigerian Ekene Ibekwe (2.06m, 100 kg, 22 years). This young Nigerian international player out of the American University of Maryland previously played in Israel for Gilboa (11 games, 18 min, 61% shooting, 5.3 rbds, against 1.1 and 11.3 pts). He is an athletic player, and he presents an interior and defensive profile similar to Waleskowski. Ibekwe left hurriedly from Israel following an incident with residents of Gliboa who allegedly threatened him. (Market News, Feb. 12, 2008) - Nigerian forward Ekene Ibekwe (206-F-85, college: Maryland) decided to leave Gilboa/Afula without notice after an off-court incident with locals which scared him, and made him leave the country immediately. Good news for all of you who had Maccabi Elite Tel Aviv in your Euroleague brackets: Terence Morris's (1997-2001) team has moved on to the quarterfinal round. Maccabi Elite qualified to move on last week, beating Real Madrid. Morris was the star of the game with this fantastic box score line: 23 points (including 4-for-5 on 3-pointers), 13 rebounds, 3 steals, and 2 blocks. In Group D, Sarunas Jasikevicius's (1994-98) run in the tournament is over, as his team, Panathinaikos, lost their final game to Partizen Igokea, despite 20 points from Sarunas. They had won in week 5, edging group winner Montepaschi Siena (Sarunas: 12 points, 5 assists). Panathinaikos, who was the defending champion of this tournament, finished in 3rd place (2-4) in their group. On a bright note for Sarunas, he was named as one of Europe's Top 50 Contributers in the past 50 years, as part of the 50th anniversary of European Club basketball. Here is the write-up about him. Although not an experienced dunk contest competitor, Randle was happy for the chance to be involved in the All Star experience. "This is the second dunk contest I have participated in. They asked me if I wanted to participate in the All Star game and I said sure, I get a free jersey so I’m cool." The picture is from the FIBA Europe main page. The Euroleague Championships are rolling on without Drew Nicholas (1999-2003). Nicholas's former team, Efes Pilsen, lost its rematch with Sarunas Jasikevicius's (1994-98) Panathinaikos, though Sarunas only had 3 points and 3 assists. Sarunas scored 16 points in last week's loss, so he and Panathinaikos are now 2-2 with 2 games to go in this round. Terence Morris (1997-2001) and Maccabi Elite won a big game against previously undefeated Real Madrid last week. Morris had 16 points, 15 rebounds, and 2 blocks. But his team followed up the big win with a shocking loss at home (Morris: 15 points, 10 rebounds), so they are still stuck in the middle of the pack at 2-2 in their group. Lastly, the Frederick News-Post has a short article about Terence's success in Israel this week. Efes Pilsen of Istanbul, Turkey has de-registered two players from its Euroleague roster and released both following their refusal to travel with the team to Top 16, Game 3 in Belgrade, Serbia a week ago. Efes on Wednesday officially de-registered the team's top scorer, shooting guard Drew Nicholas, and backup playmaker Rashad Wright. A third player, center Loren Woods, is expected to follow suit shortly. A fourth who also skipped the game in Belgrade, power forward Andre Hutson, was reinstated by the team over the weekend. All four players cited personal security concerns last week for not traveling to Serbia after communication they received from the United States embassy there contradicted guarantees of security from the Turkish embassy in Belgrade as well as city authorities and the host club, Partizan Belgrade. Three other United States citizens with Efes, guard Scoonie Penn, forward Kenny Gregory and head coach David Blatt, made the trip and participated in the game, which was held without incident. Nicholas has averaged 16.5 points and 2.9 assists in 14 Euroleague Basketball games this season. Travis Garrison (2002-06), who started the season in South Korea, then moved to Spain, has now returned to the western hemisphere to play for Gaiteros de Zulia of Venezuela (translation). If you scroll down to the news on the Gaiteros web page (there's no direct link), it looks like their season just started last week and Garrison is already leading the team, getting 23 points and 11 rebounds in their most recent game. Mike Batiste and Sarunas Jasikevicius led Panathinaikos with 12 points apiece and Vassilis Spanoulis added 10. The Greens led 8-16 early, but Nicholas fired in three consecutive three-pointers to get Efes back. Drew Nicholas gave this interview after the big win (which the Terrapin Nation blog alerted me to). Efes lost their next game in OT, despite 12 points and 7 rebounds from Nicholas. Panathinaikos won their next game, though Sarunas scored only 4 points on back-to-back jumpers at the beginning of the 2nd quarter. The two teams are now tied for 2nd place in Group D. Drew Nicholas is making news this week, as he and other American players are refusing to travel to Serbia for their next scheduled game because of security concerns over anti-American sentiment resulting from Kosovo's recently declared independence. Meanwhile over in Group F, Terence Morris (1997-2001) and Maccabi Elite (of Tel Aviv, Israel) are also in a 2nd place tie, with a 1-1 record. They won their first game, as Morris scored 16 points and grabbed 11 rebounds. But Maccabi lost their second game, with Morris getting 7 points, 5 rebounds, and 2 blocks. Today was the NBA trade deadline, and Joe Smith (1993-95) and Juan Dixon (1998-2002) were among the players that switched teams. Earlier in the day, I saw a rumor that they could be traded for each other, which would have been cool, but it didn't happen. Smith, a 12-year veteran, has played in 50 games (35 starts) for Chicago this season and has averaged 11.2 points on .466 shooting and 5.3 rebounds in 22.9 minutes per game. In 866 games (611 starts), he has career averages of 12.0 points, 6.9 rebounds and 1.1 assists. Dixon teamed with Steve Blake and Chris Wilcox to lead Maryland to the 2002 NCAA title and was a first-round draft choice of the Washington Wizards that season. He played three years with the Wizards before signing with Portland as a free agent prior to the 2005-06 season. In his first year with the Trail Blazers, Dixon had his best NBA season, averaging 12.3 points a game. This makes the second straight year Dixon was dealt at the trade deadline, being sent to Toronto last Feb. 22 in a deal for Fred Jones and cash. Houston Rockets guard Steve Francis, who has been sidelined since late December with what was originally diagnosed as bi- lateral quadriceps tendonitis, will reportedly undergo season-ending surgery. According to the Houston Chronicle, the team is expected to make an official announcement concerning Francis' status Thursday. Francis visited a specialist in Colorado last week, and a tear in the quadriceps that would require surgical repair was discovered. The Houston Chronicle says Francis hopes to be back next season.